Spring’s Meltwaters Bring Drama To Local Waterfalls: Explore All Seven! May is the best time to discover our National Capital Region’s pretty waterfalls because winter’s melted ice and snow provide extra volumes of runoff to transform falls into dramatic cascades. Moreover, the first two weeks of May are usually blackfly- and mosquito-free – always a good thing! So grab the kids, make sure they’re dressed in comfy clothes and shoes that can tolerate some mud or water, pack a picnic – and head to the hills! Here’s an idea, why not make it your mission to visit all seven? 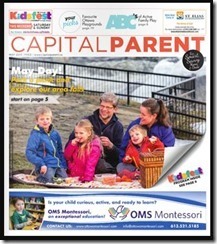 Read the full article on the Capital Parent web site.